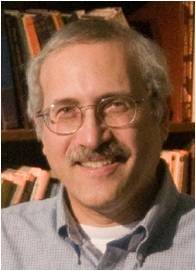 Mathematical and computational ecology; environmental modeling and restoration; grid-computing and multimodeling of ecological systems linked to abiotic influences; spatial optimization and control in conservation ecology and natural resource management; theory for savanna systems; quantitative curricula and training for the life sciences. In collaboration with Donald DeAngelis of the US Geological Survey, the staff of The Institite for Environmental Modeling and numerous colleagues, the ATLSS Project (Across Trophic Level Sytem Simulation) has been developed as one of the largest ecological modeling initiatives ever attempted, with the objective of providing a firm scientific basis for public policy decisions governing long-term water planning in South Florida. This is a multimodel, linking together models for biological components (species, functional groups) operating at differing spatial and temporal scales with physical system components. These provide a method for relative comparisons of the impacts of alternative hydrologic scenarios on various biotic components, meeting the diverse needs of numerous stakeholder groups involved in Everglades planning. I believe that most problems of applied ecology can be phrased as ones of spatial control: what to do, where to do it, how to implement it, and how to assess the implications of the actions taken. In collaboration with numerous colleagues, I have been developing both theoretical aspects of spatial control in application to natural systems, including spatial control for individual-based models, as well as very applied aspects such as methods for controlling certain invasive species and choosing locations for vaccination. Forests and savannas make up approximately 40% of the land area of the world. Fires and other disturbances are critical to the maintenance of these natural systems in addition to having huge impacts on the resources the systems provide for human use and in contributing to ecosystem services. In a series of paper with several collaborators, I have developed models at several scales that elaborate impacts of disturbance in maintaining savanna systems. I have developed over the past two decades a variety of courses, modules, workshops and curricular materials to assist the mathematical and computational training of life science undergraduates. 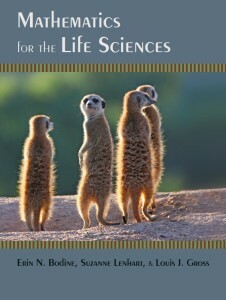 The entry-level mathematics sequence I developed was used as a case-study in the Bio2010 report, I have been an advisor and co-author of the Vision and Change project and am the co-author of a new textbook on math for life science students that incorporates the diversity of conceptual quantitative foundations that is encouraged by these reports. Hastings, A. and L. J Gross (editors). 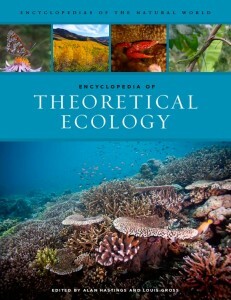 Encyclopedia of Theoretical Ecology. University of California Press (2012). Bodine, E., S. Lenhart and L. J. Gross. Mathematics for the Life Sciences. Princeton University Press (2014). Available in August. Yin, L., S-L. Shaw, D. Wang, E. A. Carr, M. W. Berry, L. J. Gross and E. J. Comiskey. 2012. A framework of integrating GIS and parallel computing for spatial control problems – a case study of wildfire control. Int. J. Geographical Information Sci. 26:621-641. Bodine E.N., L. J. Gross and S. Lenhart. 2012. Order of events matter: comparing discrete models for optimal control of species augmentation. Journal of Biological Dynamics 6:31-49. Beckage, B., L. J. Gross, W. J. Platt, W. Godsoe and D. Simberloff. 2012. Individual variation and weak neutrality as determinants of forest diversity. Frontiers of Biogeography 3:145-154. Gross, L. J. and B. Beckage. 2012. Toward a metabolic scaling theory of crop systems. Proceedings of the National Academy of Sciences 109:15535-15536. Federico, P., L. J. Gross, S. Lenhart, and D. Ryan. 2013. Optimal control in individual-based models: implications from aggregated methods. American Naturalist 181: 64-77. Gross, L. J. 2013. Use of Computer Systems and Models. In: Levin S.A. (ed.) Encyclopedia of Biodiversity, Second Edition, Volume 2, pp. 213-220. Academic Press, Waltham, MA. Beckage, B., S. Kauffman, A. Zia, C. Koliba and L. J. Gross. 2013. More complex complexity: Exploring the nature of computational irreducibility across physical, biological, and human social systems. In H. Zenil (ed.) Irreducibility and Computational Equivalence: 10 Years After Wolfram's A New Kind of Science, pp. 133-143. Springer, Berlin. Kultz,D., D. F. Clayton, G. E. Robinson, C. Albertson, H. V. Carey, M. E. Cummings, K. Dewar, S. V. Edwards, H. A. Hofmann, L. J. Gross, J. G. Kingsolver, M. J. Meaney, B. A.Schlinger, A. W. Shingleton, M. B. Sokolowski, G. N. Somero, D. C. Stanzione and A. E. Todgham. 2013. New frontiers for organismal biology. Bioscience 63: 464-471. Gross, L. J. 2013. Selective ignorance and multiple scales in biology: deciding on criteria for model utility. Biological Theory 8:74-79.